For this kitchen, designer Jan Goldman, of Kitchen Elements, designed the central island to help organise the space and provide a furniture-like piece. The classic country look often includes pieces collected here and there over several years. And this casual, relaxed aesthetic has found its way into more urbane kitchen environments as well. 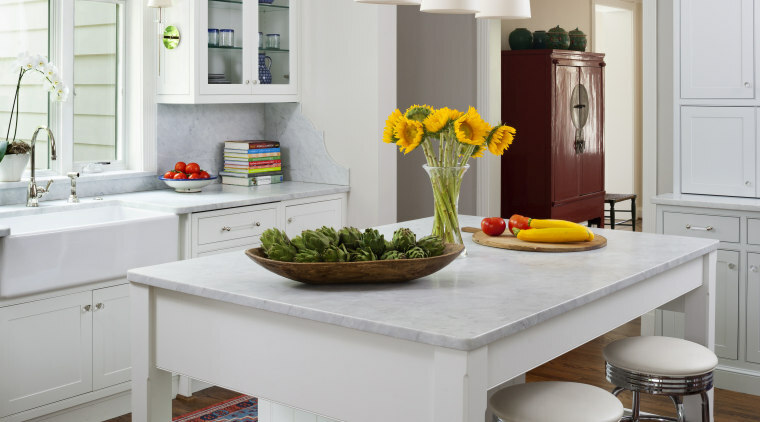 For this renovation project by designer Jan Goldman, the owners asked for an updated gourmet kitchen that was to include a functional yet stylish island with seating for family and guests. A large range and spacious walk-in pantry were also requested, says Goldman. Since the existing kitchen footprint was too small to accommodate these elements, the new kitchen was relocated to a larger room next to the old kitchen. Besides providing the necessary space, the new location has the added benefit of being more centrally located in the home so the view from the foyer is now a welcoming kitchen. An outdated powder room adjoining the new kitchen was transformed into a walk-in pantry while the old kitchen has become an eating area, separate laundry, and powder room. 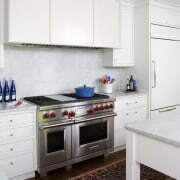 This above-counter cabinet is in a light silver, contrasting the mainly white cabinetry and building on the idea the kitchen was gathered together over time. "In the new kitchen space, we replaced a sliding door leading to the garden with a large window to create a sink wall and garden view. 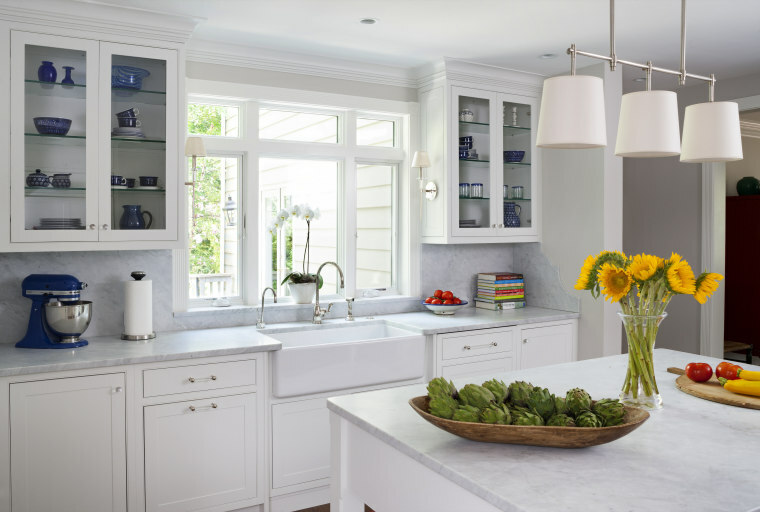 The window is flanked on both sides by glass-fronted cabinets to evoke a light, airy feel." The island helps keep the kitchen open and airy as well partly due to its design which allows for seating and display storage. Its table-like legs, slatted wood platform and v-groove surfaces all create the feel of a piece of furniture. "While the cabinet panelling is transitional, I wanted to create the sense that the kitchen was collected together over a longer time frame an amalgamation of different much-loved pieces." 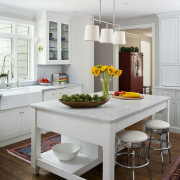 As well as the table-like island, the kitchen has other elements that might also have been added over many years. For example, one above-counter cabinet brings a strong vertical element in the room. 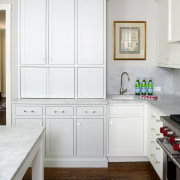 This has been finished in a light silvery grey, subtly contrasting the otherwise pristine white cabinetry. Again, the effect is as if this was acquired separately and then added to the overall design mix. In this renovation project by designer Jan Goldman, the bright, white hues are grounded by the warmth and tone of natural wood floors. The designer also finished the integrated rangehood in the same tone, to bring balance. "There are several individual touches that bring personality to the design," says Goldman. 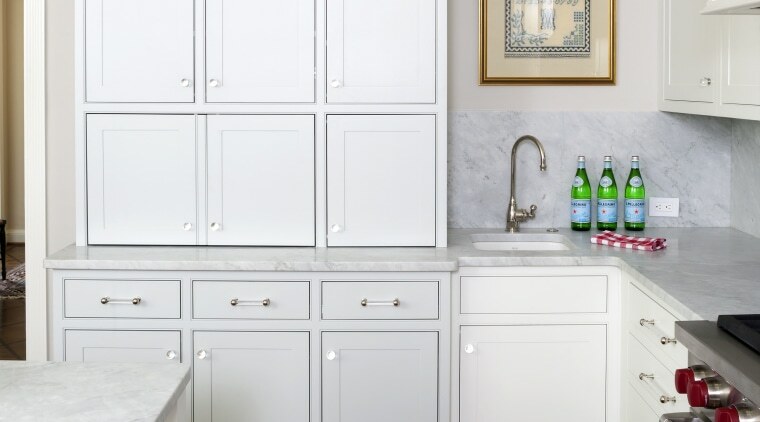 "The farm sink for clean-up offers a soft touch, for example, and I love the custom side detail on the Carrara marble backsplash where it cascades down to the countertop in the same stone."